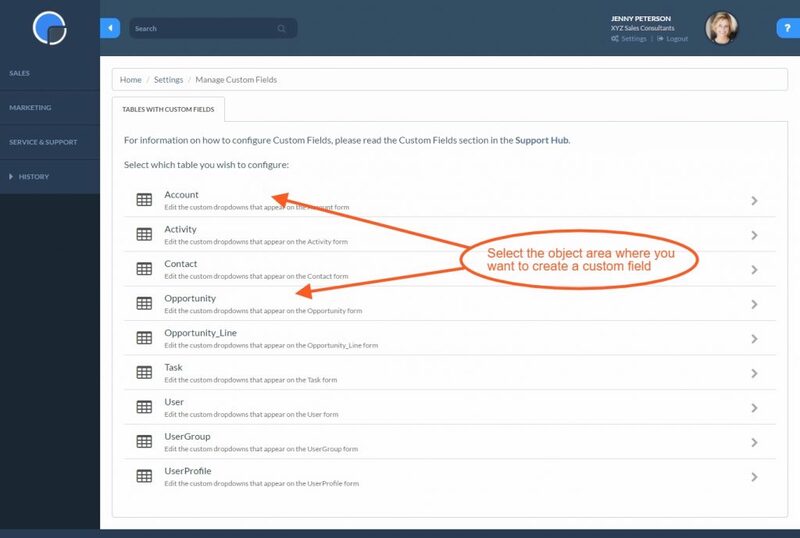 What are CRM Custom Fields? Fields are the data titles under which your customer account information is stored in the CRM. You can create Custom Fields to meet your business needs. Custom Fields can be added to all the major forms or ‘objects’ within the CRM including Accounts, Contacts, Activities, Tasks and Opportunities. Customisation allows you to remove or change most of the Standard Fields that come with the basic CRM system set up. The CRM Custom Fields feature is available as standard with all CRM plans. Advanced Custom Settings are also available with the Enterprise plan. N.B. Some Standard Fields cannot be changed as they are intrinsic to the functionality of the CRM. Available with the Enterprise plan only, you can further customise your CRM. You can change the position of a field on the page, create custom menus, custom widgets and much more. Please contact our customer Support team for further customisation on support@reallysimplesystems.com. To create a new CRM Custom Field go to Settings/System Settings and select ‘Custom Fields’. Selecting Custom Fields will open a list of the forms and tables you can customise. Choose which object (Account, Contact, Activity etc.) where you want to customise the fields. Selecting the object you wish to customise will display a form showing the CRM Custom Fields available to use. The Type will determine what kind of field it will be: a number, some text, a checkbox. See the Field Types section (on the tab above) for a list of Types. The LookUp Table field will choose which LookUp Table will be used to provide a dropdown list for the field, if you want one. Leave blank for free text entry. To delete a Custom Field or Standard Field just untick the Live box for that field. The data will remain in the field, and if you turn the field back on again later, that data will reappear. Be careful if you later reuse that field with a different Field Type after data has been entered, for example if you change from a CheckBox to a Date type, as it may produce unpredictable results. If in doubt, contact Customer Support to clear the existing data. If you want to create a field where you can select more than one option within the dropdown, you can use Multi-Line Custom Fields, for example for Products, where a customer may buy more than one product from you. Create the LookUp Table as normal and when you add the table to your Custom Field, select the table Type as ‘Multi-Line’. multi-line 100 Yes Allows multiple values from a Look Up table to be selected. Stored and shown as multiple values separated by semi colons. The Derived Tables feature gives a number of options to cross-refer fields within the CRM. For example, whilst an Opportunity or Task is held at the Account level you can add a Custom Field to the form to link it to a particular Contact within the Account. This means you can record which is the main Contact for that Opportunity or Task. The Derived Tables are “hard coded” into your CRM so you do not need to create a new Look Up Table – nor do they appear on the Look Up Table lists. You will need to type them into the Custom Field table using the text format as shown in the list below.